As John says the distinctive station building is the only clue on this one. The building on the right of the photograph looks very similar to the style of building at Helsby Station. Certainly the same style as Helsby. I don't think its Frodsham so Helsby seems favourite, but the name board seems to be a longer name. With a bit of faith, the station name board says 'Ellesmere Port'. At Ellesmere Port, the main station buildings are off to the left of the photo. As has been suggested it is indeed Ellesmere Port. 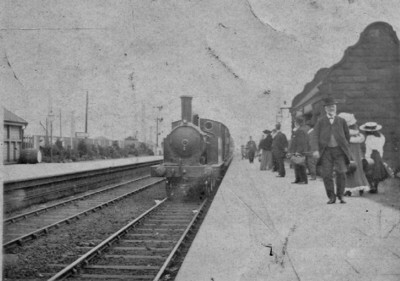 The signal visible would be Ellesmere Port Station's starting with Ellesmere Port Loop's distant - this was prior to the resignalling of circa 1925.